You get 20 different flags of the countries if the install Pocket Banners mod. The banner can be used as a decoration of castles and other buildings. To get the banners, you can to craft them or use creative inventory. Below is a list of flags of all the available countries. You can place banner on the ground, passing through it, but not be able to rotate in different directions. 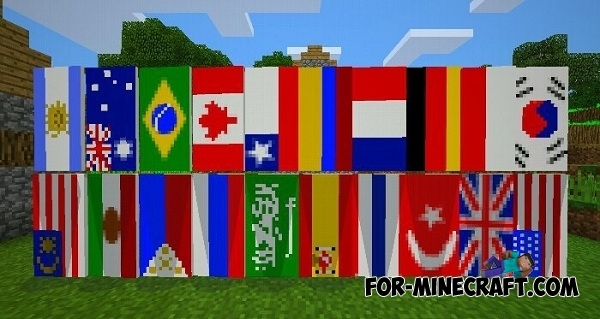 Banners Mod for Minecraft PE 0.11.0 / 0.10.5Banners mod adds twenty different banners to the world of Minecraft Pocket Edition, each representing a country flag.